Property developers, who have been battling a prolonged slowdown in sales, have seen their borrowing costs go up by 200-300 basis points (bps). Lenders such as non-banking finance companies (NBFCs), housing finance companies (HFCs), and private equity (PE) funds are asking for higher rates, a fallout of tightening liquidity after the Infrastructure Leasing & Financial Services (IL&FS) crisis. Along with HFCs, NBFCs account for about 60 per cent of real estate developers’ loans as banks stayed away from lending to developers for purposes such as buying land and refinancing in the last couple of years. While lenders such as Dewan Housing Finance have stopped loans to developers, others such as Piramal Capital are going slow on such loans after the IL&FS issue, which has posed liquidity challenges for NBFCs, said sources in the know. “Rates have changed. We are doing new deals at 150-200 bps,” said Maneesh Yadav, chief executive at ASK Financial Holdings, the NBFC arm of ASK group. While NBFCs have increased rates to as high as 18-19 per cent, PE funds are charging up to 23 per cent. Sharad Mittal, executive director & chief executive officer, Motilal Oswal Real Estate Investment Advisors, a fund manager, said: “For structured debt, return expectations in the market have moved by 200-300 bps. Our return expectations have accordingly increased from 18-20 per cent to 21–23 per cent,” said Mittal. Developers, who have been seeking higher liquidity from NBFCs, HFCs, and PEs after the goods and services tax and Real Estate Regulation & Development Act, are facing a crisis of sorts after the IL&FS default. 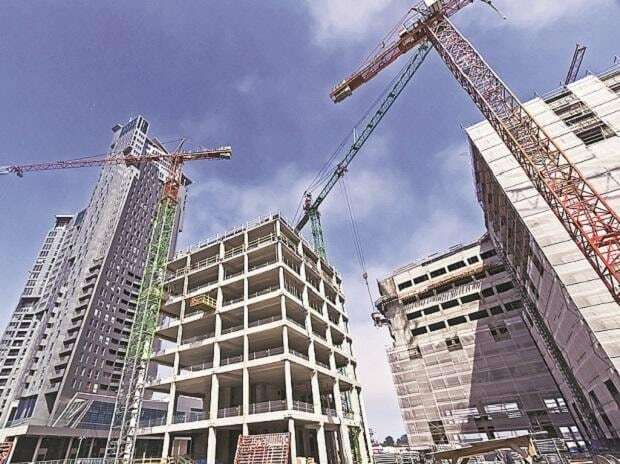 The debt burden on real estate developers has risen 3.5 times over the last three years to Rs 6.56 trillion in 2017-18, according to data analytics firm CRE Matrix. “Forget about rates, NBFCs did not have money to lend after the IL&FS defaults. After the Reserve Bank of India intervention, we hope money will flow back into real estate. There is a crisis in the interim,” said Niranjan Hiranandani, managing director at Hiranandani Constructions. 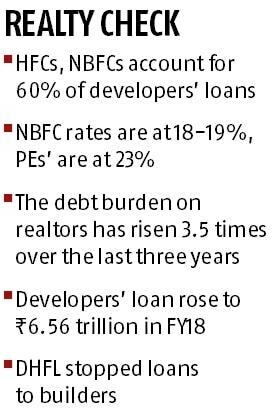 Liquidity for developers has been choked from both sides - NBFCs and HFCs - which have slowed home loan disbursals. “Prior to the crisis, NBFCs were aggressively lending to the real estate sector, which has now dried up. We believe NBFCs volumes will not go back to previous highs. NBFCs focused on real estate have not only stopped looking at new proposals, but, in many instances, they are not doing subsequent disbursals,” said Mittal of Motilal Oswal. Ashish Singh, partner at Actis Private Equity, said interest rates generally have gone up across the real estate sector in the recent months. “However, the impact of these varies widely, depending on the credit quality of developers. Risk premium for ‘AAA’ companies and companies with average credit worthiness has widened. The spread between rates, which was as high as 300-400 bps in 2015 across the credit quality spectrum, and had compressed to around 150 bps in recent years of credit expansion, has again widened to 300-400 bps,” said Singh. He added there is sufficient liquidity for developers who enjoy good credit track record. “Developers with low to moderate creditworthiness are increasingly resorting to sale of assets to shore up their credit and meet fund requirements. Fresh lending activity by NBFCs has declined,” said Singh.